This CD marks the first ever combination between Lifesong Records, Grudge Records and HME Records, creating the best CRACK THE SKY compilation package to date. 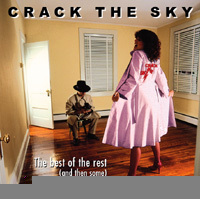 In the first CRACK THE SKY CD released in 1988, two songs were deleted to keep to the CD time limit that existed at that time. Those two songs, Mind Baby and The Radio Cries are included in this compilation. I Lean On You and Dear, Dear (Both from John Palumbo's "Innocent Bystander" album) feature the original members of the band BADFINGER singing background vocals. With the political arena heating up, listen to MR. PRESIDENT. The video for MR. PRESIDENT won the Houston Film Critic's Award. Rolling Stone Magazine called CRACK THE SKY the best new band in 1975 and the 1978 Rolling Stone Record Guide compared them to Steely Dan. The Baltimore City Paper has named CRACK THE SKY the "Greatest lost rock & roll band of all time." What do Baltimore, Buffalo, Rochester, Washington D.C., Pittsburgh, Philadelphia, Atlanta and Richmond have in common? These are the places that CRACK THE SKY did truly become "Rock Stars." The members are from Weirton, West Virginia, a small steel town 30 minutes west of Pittsburgh. This band charted five albums in Billboard's Top 200 and opened for some of the most successful bands of their time. In Baltimore, radio stations WGRX and WIYY (98ROCK) rank the group up with regular staples such as Aerosmith & Led Zeppelin. WGRX Music Director Lee Geary says, "Requests still come in regularly and they test very well." A recent show at the Recher Theatre in Baltimore brought fans from as far as Seattle. With The Best Of The Rest (And Then Some) listen to what Crack The Sky has been about.